Kenedy concluded an implausibly nightmarish performance by having a stoppage-time penalty saved as 10-man Newcastle United drew 0-0 at Cardiff City. The on-loan Chelsea winger failed to complete a pass during a first half when he should have been sent off for kicking out at Victor Camarasa. 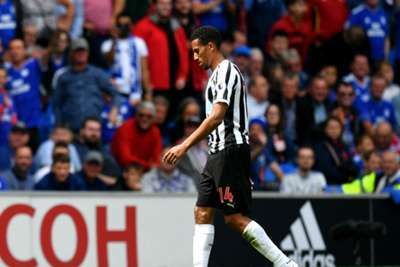 Newcastle belatedly had their numbers reduced when Isaac Hayden's 66th-minute foul on Josh Murphy was adjudged worthy of a red card by referee Craig Pawson. Cardiff captain Sean Morrison handballed substitute Yoshinori Muto's cross to give Kenedy a 96th-minute shot at redemption, but Neil Etheridge guessed correctly to save from the spot as he did in the Bluebirds' 2-0 defeat at Bournemouth last weekend. FULL TIME: #CardiffCity 0-0 @NUFC! Ayoze Perez made a vital block when Cardiff defender Sol Bamba headed Joe Ralls' corner goalwards in the 10th minute. As a predictably fractious affair provided little entertainment, Kenedy was incredibly fortunate not to be sent off for kicking Camarasa when a 33rd-minute turn went awry. Kenneth Zohore nodded wide for the hosts before the hitherto quiet Jonjo Shelvey found Perez with a raking pass – Etheridge dashing sharply from his line to smother the shot. Zohore badly misjudged a 54th-minute header when picked out by Ralls and Cardiff were still on top when their hand was strengthened. Hayden was introduced at half-time, Newcastle boss Rafael Benitez seemingly wary of the booked Javier Manquillo being sent off. The substitute suffered exactly that punishment for clumsily going through the back of Murphy. A rousing push for victory never emerged for a well-organised but ponderous Cardiff, leaving Kenedy to round off his ordeal as Etheridge parried to safety. The paucity of quality on display means it is hard to imagine either Neil Warnock's Cardiff or Benitez's men operating at too great a distance from the bottom three. They are on the board with a point apiece and it feels like all further progress will be gruelling. Famously a long-established favourite of his manager, Bamba will not have thanked Warnock for leaving him marooned in holding midfield in the loss to Bournemouth. Back at the heart of defence, he was typically authoritative - making 16 clearances - and Newcastle's attackers never had a sniff from the scraps fed to them. A fitting appearance in this category for Kenedy, who almost managed to do exactly that to Camarasa. Football Association disciplinary action will likely be forthcoming and it would be a timely break for the 22-year-old. What persuaded him to take the penalty when almost everything else he contributed went completely wrong is anyone's guess. - Cardiff have failed to score in three consecutive league games for the first time since November 2015. - Newcastle are now unbeaten in their last 11 league meetings with Cardiff, winning 10 and drawing one, since a 0-1 defeat in February 1981. - Rafael Benitez oversaw his 50th Premier League game with Newcastle, winning 15, drawing 13 and losing 22. - Etheridge is the first goalkeeper to save a penalty in two consecutive Premier League appearances within the same season since Thomas Sørensen in December 2009 (v Arsenal and Wigan Athletic). Cardiff travel to Huddersfield, where a positive result feels vital given it precedes games against Arsenal, Chelsea and Manchester City. Starting with Chelsea, Newcastle also have those trio of heavyweights in their next three fixtures.